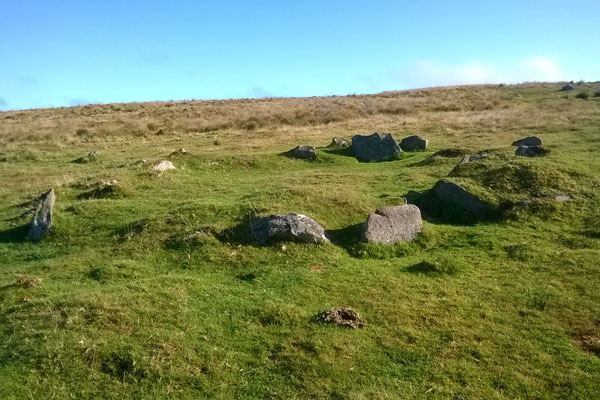 Bronze Age settlements are particularly prevalent across Dartmoor. Hut circles and farm enclosures are the best direct evidence of this wholesale occupation of the land. Often these settlements are closely linked to other Bronze Age curiosities, for example; stone rows, cairns, cists and stone circles. These structures are quite often nothing but a series of tumble-down piles of rocks however once you recognise the patterns they are surprisingly easy to spot. Hut cirlces are surprisingly regular in their appearance. They are found as a circle of weathered and flatish granite bolders standing up to 2-3 three feet in height. 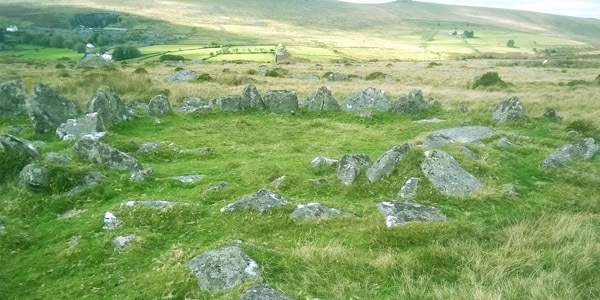 The hut circles themselves exisit in sizes ranging from 6-15 metres in diameter. On the southern side of any hut cirlce you will always find two prominent stones which act as door pillars. The southern side would offer favourable weather and as much natural light as is possible. It is understood that a conical-shaped roof would be built up from the stone wall to the centre of the hut propped up by a series of wooden supports circled inside the structure. Enclosures are generally ellipsoid in nature and range from 50 metres in diameter, right up to serveral hundred metres across. The walls are made from stacked granite boulders and often have 1-3 hut circles within their internal footprint. When stumbling upon a larger settlement, sometimes additional enclosures are built out from an initial main wall, in a series of ellipsoids. When expansion of a settlement occurs it is possible to relatively date the growth and progress of the settlement gaining some insight and a moment-in-time snapshot into the lives of these Bronze Age people. In the example image shown right the settlement of Riders Rings can be seen on the light green coloured hillside. Well we cannot ignore the fact that the very existence and hence the naming of the Bronze Age was heavily reliant on an accessible supply of Tin and Copper to make the neccesary tools and artefacts of the era. Dartmoor and the local hills are awash with opencast tin-streaming. Dartmoor provides a great source for these metal-ores. But this cannot explain alone why Dartmoor was so populous in this period. 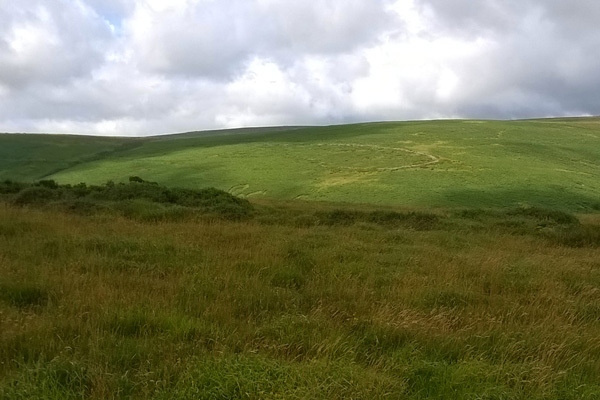 The best suggestion for the rich number and variety of settlements on Dartmoor relates to the poor or weak tree cover of the moors, even several thousand years ago. Acidic soils cultivated by the granite bedrock and higher elevation of the open moor make for weaker, spindlier trees. This in turn makes the land easier to clear and cultivate for farming. It wasn’t until the Iron Age that new cutting tools could be fashioned from harder metals which allowed for the industrial clearance of the lowlands. One question that remains for the passer-by is why were these villages abandoned and never reclaimed. It would appear that the answer relates to the development of new more sophisticated tools and farming methods in the period 1500 BC – 800 BC. These changes along with shifts in global weather patterns about this period perhaps made the lowlands a more attractive propostion.